This recipe is adapted from Elana’s Pantry first cook book, which I love. These cookies may sweep you off your feet, literally. As you can see I am a fan of chocolate and chile too. Strong and bold flavors are my cup of tea. Part of my Lebanese and Mexican heritage. This is when I discovered that umami needs to be present in my pastries. I don’t like anything plain or what I call very simple flavors that are sugar coated which is a huge problem in most bakeries. Sugar can kill flavors and does not let the real ingredients shine through. On our last visit to Huckleberry in LA I realized that as much as I wanted to love the bakery (in essence I do) everything had a sugar crust that killed the individual elements of their baked goods. Sad story. Luckily I grew up with chile, spice, bold Lebanese flavors, acid notes from labne and sumac and eating chamoy so it is in my blood and veins to create a savory sweet experience that satisfies every inch of your palate. These cookies also became viral with my online classes that started my Noble Baking concept. Thousands of people have made them and sell them all over the world. Preheat convection oven to 330 F regular oven 340 F. Prepare 2 baking trays with Silpat. I love perforated trays as they also work as cooling racks and they fit into a rack perfectly. Shape cookies with a medium scoop #24, put onto the prepared trays with enough room as they do expand. Flatten cookies lightly with your hands. Bake in pre heated oven until crisp on the sides and soft in the middle. Store in individual cellophane bags or in plastic domes, they don’t keep well in Tupperware or plastic containers (they become soft and moist). You can of course eliminate the jalapeño and perhaps just add Jamaica (hibiscus) salt on top. Or feel free to experiment. These cookies became the inspiration behind a great vegan brownie one of my students made. I will add the recipe soon. Estás son mis galletas favoritas!!!! las he hecho en repetidas ocasiones y son simplemente maravillosas!! Hey Buddy!, I found this information for you: "MY SIGNATURE NOBLE SPICY DOUBLE CHOCOLATE COOKIES". 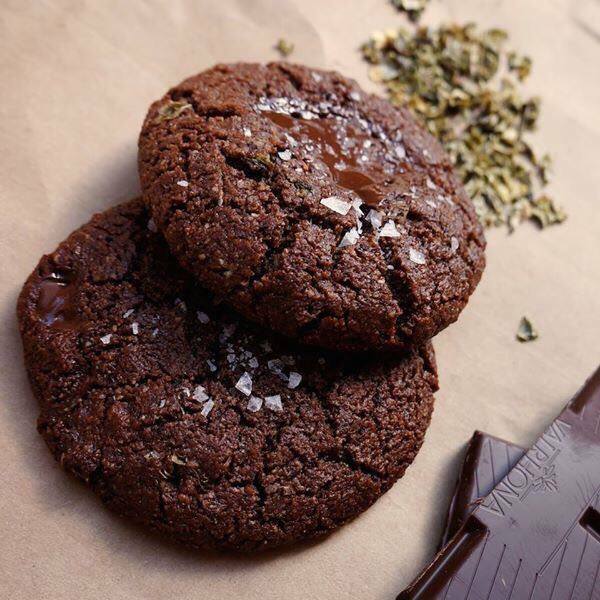 Here is the website link: https://www.vanessamusi.com/my-signature-noble-spicy-double-chocolate-cookies/. Thank you.